In 1983 a passionate hobby turned to a profession. 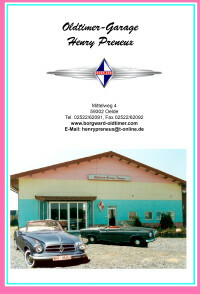 This was the year when the Oldtimer Garage of Henry Preneux was founded. During more than 30 years we learnt a lot while repairing 40 Isabella vehicles and modernising convertibles. We can claim the quality of our work being on a level which only few restoration shops in the world can offer. The passion for the Borgward brand is still an obligation for us to do the best. Contrary to many other oldtimer restore shops we do not work in a backyard shop. Kindly have here a look on a few images of our two work shops. We are convinced that our good equipment offers the quality you will appreciate. Our concern when restoring Borgward cars mainly turns to the Borgward Isabella. Since 1983 a lot of experience and know-how was gained considering the restoration of this Borgward model. Restoration means for us that the car when it is finished looks like a brand-new one that has just left the factory without changing the details. Have a look on these pictures of a treated car body. In our work-shop the finished body is enamelled with original Borgward colours according to the chart of colour range. This maintains the original character of the car also in respect to the colour. A car body that is rust-free and enamelled needs of course a good functioning technique. The following parts are totally dismantled, newly measured and fit together again. Now the car can drive and looks beautiful from the outside. The only thing that is still missing is the interior furnishing. Optionally we restore the seats either with real skin leather or imitation leather. Details like the clock in the lid of the glove compartment will be restored, too. Now your dream car is looking like one that has just left the Borgward factory. Your safety will be improved by installing a servo-unit for the brakes. To round up the model we would advise to equip the car with broader tires and rims. Regarding good quality it is not easy to find spare parts for the Isabella car. Our unique and nearly complete programme of replace parts for this Borgward type and others will enable a save future supply without problems. All replace parts from our offer are reproductions which we put in hand correspondingly to original parts. This guarantees a proper fitting and reliable service.